Ceres Childcare & Preschool Home Page! Top 15 of my tried and true homemade messy but fun craft recipes. Mix water, corn syrup, and vinegar in a pan and bring to boil. In another bowl, mix the cornstarch and cold water. Add the mixtures together and stir until blended. Let stand overnight before using. Mix equal parts cornstarch and water. Courtesy Lisa Murphy (AKA "The Ooey Gooey Lady": Cornstarch and water will mix together but will not dissolve - This is suspension. By definition, a suspension is a substance which has the properties of a solid and liquid at the same time. •Create different size bubbles by using homemade frames or household items such as a strawberry basket. Use bell wire (plastic coated for safety) to make large frames for big bubbles. Make a square frame – bubbles will always be round! Combine water, oil, salt, cream of tartar, and food coloring in your bread machine pan and turn it on to the dough setting. If you do not have a bread machine you may cook it on the stove in the traditional way. Combine water, oil, salt, cream of tartar, and food coloring in a saucepan and heat until warm. Remove from heat and add flour. Stir, then knead until smooth. Put a tablespoon or two of alcohol in a bowl and add a few drops of food coloring. Add pasta and stir until it is colored. Spread out on a plate or a pan if you are doing a larger amount. 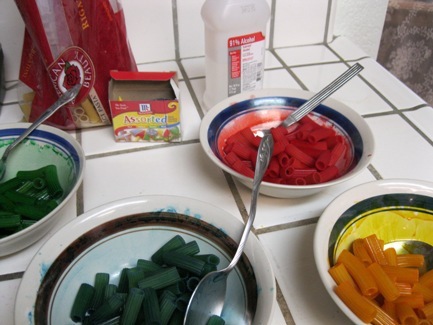 The possibilities for using colored pasta are endless. Use for collage, stringing, sorting, sensory play, etc. 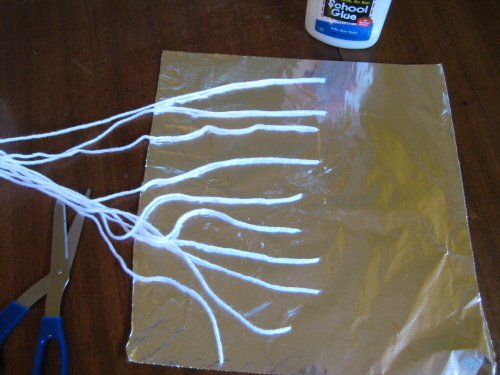 Here is my original idea to make yarn for stringing pasta easier for preschool children. Rub glue on the tip of the yarn strings (about two inches or so). Seperate the strings and let dry on foil sheets or wax paper.. Mix ingredients well and knead until smooth - then play. Thoroughly blend glue and room temp. water. In larger bowl, combine hot water and Borax, stirring until Borax is dissolved. Slowly pour glue mixture into Borax mixture, stirring constantly. Turn out and knead until it isn't sticky anymore. Give children markers to color on it. Will keep for weeks in a tightly covered container in the fridge. Wonderful sensory activity. Try different textures of materials to paint on (freezer bags, paper bags, aluminum foil...) 1 T Cold water 2 T Cornstarch 1 C Boiling water Food coloring Combine cold water and corn starch. Stir until smooth. Add boiling water and stir again, until smooth. Add food coloring until paint is desired color. Let cool. Store this paint in a covered container. If mixtures dries between uses, add water to thin it. Place broken crayon peices in an old muffin tin. Put in preheated 250 degree oven until melted, about 15-20 minutes. Turn off the oven and let cool without moving to ensure colors do not mix toghether. From Art Guru MaryAnn Kohl: Peeling Crayons Tip: Soak them overnight in plain water. The paper slides right off! THANKS! Mix equal parts of flour, salt and water in a bowl. Add a small amount of tempera paint to the mixture and pour into a small plastic squeeze bottle . Repeat the procedure making as many colors as you wish. Squeeze onto heavy paper or cardboard to make designs. Mixture will harden into puffy shapes. Pour white glue into small cups. Mix your choice of liquid tempera paint in each. Use to paint on wood, paper, or cardboard as you would with any paint. Paint will dry shiny as if glazed. Variations: Paint pine cones, driftwood, rocks or glass. Try painting with sponge brushes for a very smooth finish. To help paint adhere to shiny, smooth surfaces, add a few drops of dish detergent. Easily removed by soap and water. Combine the flour and cold water. Put mixture into a saucepan of boiling water - bring to a boil. Remove from heat and stir in sugar. Let it cool; it will thicken as it cools. Once cooled, it is ready to use. Great for piñata's! with your name(optional) so that we can give you proper credit. If you have images to go with your submission, please attach them to the same email.